Have a plan. Because the team had a plan and project designs, they were ready to go when funding was available. Start simple. The team found that simple green infrastructure projects like rain gardens were a great teaching method to show how natural and nature-based solutions could manage stormwater. The effort got people involved and showed them what they could do on their own properties. Champions really do help. A community member or community leader who has a vested interest in the project can make the process smoother and keep it going forward. Look for knowledge transfer opportunities. Many agencies and community members attended the workshop. Therefore, a secondary impact was the building of a base of staff members and concerned citizens to assist in future installations and catalyze community action. Get permitters involved early. Although permitting has many steps, getting permitters involved early paid off because they were excited about the project and wanted to push it through. This could help future green infrastructure projects. Check on material and plant status. Checking on the status of materials and plants periodically in the planning process proved to be important. Materials such as mulch, rock, and soil amendments need to be checked in person for quantity and quality. Plants specifically grown for the garden should have their progress monitored. We learned from our experience that we cannot depend on agencies to donate plants and have now contracted a commercial farmer to propagate native and non-invasive plants for future gardens. Invest in interpretive signs. Taro, an edible, culturally significant plant, was used in the rain garden, but someone helped themselves to this edible plant. Interpretive signs are needed to educate visitors when a guide is not present, but the team is considering leaving out edibles in the future. Possibly avoid compost. Extra nutrients found in compost are problematic for this area, as well as expensive and of varying quality, so they might be excluded in the future. Learn how simple, low-impact development projects for controlling stormwater can build local support for natural and sustainable practices. Meagan Curtis, a watershed coordinator with the American Samoa Coral Reef Advisory Group, and her team are working to help reduce stormwater impacts in the Village of Faga’alu, American Samoa, through the use of natural and nature-based projects, such as green infrastructure. In 2015, the group coordinated and conducted a rain garden installation training clinic. The purpose of the clinic was to 1) construct a demonstration rain garden, 2) increase local capacity to install future rain gardens, and 3) provide instructional materials that could be adapted by the advisory group for future use. The main driver behind this project and others is Faga’alu watershed’s failure to meet water quality standards set by American Samoa’s Environmental Protection Agency (excess total nitrogen, total phosphorus, dissolved oxygen, and Enterrococcus bacteria levels). These stressors impact water quality, fishing, quality of life, and human and coral reef health. The NOAA Coral Reef Conservation Program chose Faga’alu as a priority watershed for developing a watershed management and conservation plan. This planning process focused on identifying key threats and improving management of watershed resources. Priority threats identified include poor management of litter and trash, excess sedimentation, and declining fisheries. Community members are also learning how to manage their resources from ridge to reef. This work was done in partnership with the Land-Based Sources of Pollution Local Action Strategy Group. After the plan was complete, the program funded the Horsley Witten Group to develop an implementation plan. Several projects were designed that could be implemented once funding became available. These included increasing knowledge on stormwater and conducting projects that reduce stormwater impacts. In 2012, Faga’alu was chosen as a priority site for the U.S. Coral Reef Task Force Watershed Partnership Initiative, providing additional funding along with Coral Reef Conservation Program dollars to make priority projects possible, including the rain garden installation training clinic. Rain gardens are fairly simple to install, which make them a great teaching tool about how well nature-based solutions can help absorb rainwater. Meagan’s role was to coordinate and help plan the rain garden installation workshop. Meagan’s team included Anne Kitchell, an environmental planner with the Horsley Witten Group, Inc. Anne helped evaluate potential sites and drafted designs and sizing calculations based on the proposed sites. Anne also worked with Todd Cullison, executive director of Hui o Ko’olaupoko in Hawaii, to design and teach the training clinic. Todd developed a rain garden manual for Hawaii, and Anne has been holding similar rain garden installation workshops on other Pacific Islands. These materials and experiences helped inform the Faga’alu training clinic. A civil and environmental engineer from Horsley Witten rounded out the team. Three sites were evaluated for the rain garden installation: an interior courtyard at the hospital, a public elementary school, and the Faga’alu Beach Park. Designs were developed and permits were obtained for two sites. However, site visits revealed that the hospital site was not suitable, so ultimately the beach park was selected. Meagan also helped to acquire the permits needed, a process that took approximately two months. She worked with the permitting office to provide the necessary information, such as a site plan which shows the proposed project’s size, use, topography, location of streams, wetlands, roads, and other features. She also met with various government agencies during site inspections. The site plans were drafted in collaboration with the Department of Public Works. The land use permits were approved by the Public Review and Notification System board and administered by the Department of Commerce. The permit application is a simple form but required the governor’s signature, since all proposed sites were located on public lands. Before the rain garden installation training clinic, it was crucial to get buy-in from local leaders. NOAA staff members from the Pacific Islands Regional Office contacted the Office of Samoan Affairs for permission to give a presentation on the rain garden project for over 60 mayors and village representatives. An overview of the project was given by NOAA and Horsley Witten during the biweekly meeting that is held to discuss island issues. This was an opportunity for the project team to invite the leaders to the rain garden installation workshop and to discuss opportunities to bring future installations to other villages. The project team offered to tour any villages while on island to discuss drainage issues and look for potential rain garden opportunities. All mayors received a rain garden project application to share with their villages. The mayors suggested that training materials also be made available in the Samoan language. The two-day training was attended by 35 people from local agencies and villages. On the first day, Anne and Todd lead participants through the basics of rain garden features, site selection, design, and maintenance. In the afternoon, participants went outside to look for rain garden opportunities around the Office of Samoan Affairs facility. During the second day, Anne, Rich, and Todd led the participants in the construction of the rain garden and the local Land Grant program provided plants and planting guidance. Local support and donations made this installation possible. 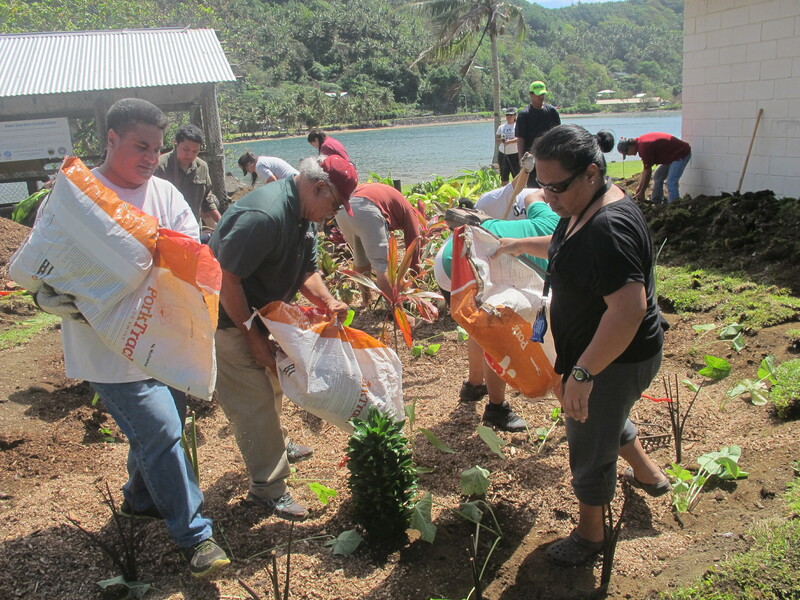 America Samoa Community College’s horticulturist provided a variety of plants, and the Department of Agriculture donated taro. The Faga’alu Village mayor donated tools and equipment, and Samoa Maritime donated equipment and operator time, stone, and filter fabric. Each participant was given an American Samoa-specific rain garden installation training guide, as well as copies of a general maintenance plan. The manual is a do-it-yourself guide that takes builders through the processes of locating, sizing, constructing, and planting a rain garden on their own properties. Electronic copies of all instructional materials and training slideshows were made available to Coral Reef Advisory Group for distribution and were translated into Samoan. Several participants are identifying locations for additional rain gardens at the school. The Department of Parks and Recreation is applying for a grant to implement green infrastructure, including rain gardens, at multiple park locations. Rain gardens in public parks will now be taken over by the department, funds will go toward additional schools, and the Coral Reef Advisory Group will assist Parks and Recreation when needed. Coral Reef Advisory Group will be installing more rain gardens through National Fish and Wildlife Federation and Office of Insular Affairs funding. So far, 11 new sites have been permitted for rain gardens. A Coral Reef Advisory Group coral reef fellow is dedicating a portion of her time to the planning and implementation of rain gardens at schools and other public spaces. 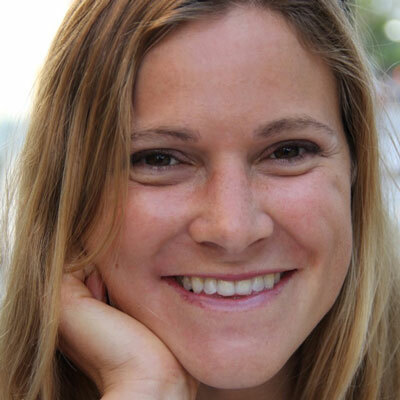 She is also working on stormwater and green infrastructure educational materials and lessons. Hui o Koʻolaupoko continues to do community outreach and projects to promote the use of rain gardens and other green infrastructure techniques to help manage stormwater.